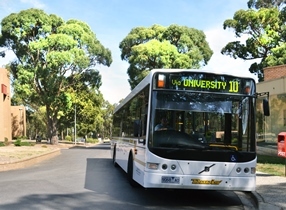 Gippsland Campus has a regional bus service (Latrobe Valley Buslines) connecting Churchill with Morwell and Traralgon. Morwell bus arrives and departs from the railway station and connects with V/Line train and coach services. The Morwell-Churchill bus service operates between 6:30am and 9:30pm on a 1 hour rotation. On campus, the bus arrives and departs from the campus bus loop (off Northways Road). V/Line provides a rail service connecting Traralgon and Morwell with Melbourne (Southern Cross Station). The service takes approximately 2 hours 15 minutes and runs on a 1 hour rotation. 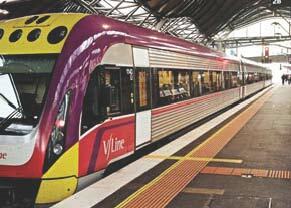 V/Line also has a coach service connecting Morwell and Traralgon with Melbourne and other regional centres. Gippsland Campus is easily accessible by bicycle. The campus offers bike loops throughout. Along the Princes Freeway near Morwell, take the exit to the University and follow the FedUni signs into the township of Churchill where the campus is located. As you enter Churchill, turn left at Northways Road and the University will appear ahead. Maps and directions are available online. Free parking is available across the campus and can be viewed on the campus map. See the campus map for locations. Staff and students can sign up to our free online carpooling software to share a ride and save on fuel costs. Whether you're a driver or passenger, the carpooling software will find someone going your way to one of our campuses. Myki is Victoria's ticketing system for train, tram and bus services throughout the state. 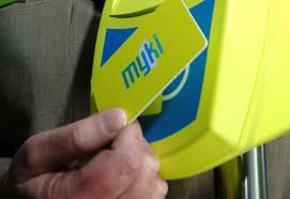 Myki is a smart card that uses prepaid credit to pay for your fare. A blank myki costs $6 and can be purchased from newsagents and railway stations. Topping up a myki can be done online through Public Transport Victoria website or bus drivers can load up to $20 cash into the myki. Once the card has credit you simply swipe the myki sensor when boarding and departing all trains, trams and buses. Some students are eligible for a 50% discount on all public transport in Victoria and to receive a concession you must purchase a VPT concession card. Students who do not have a VPT card and request a concession fare can be fined by patrolling transport officers. A FedUni ID card does not entitle you to a concession fare. VPT cards cost $9 and students will need to complete the VPT concession form and provide two passport photos. Generally, full-time domestic students are eligible. International students, part-time students, post-graduate students and apprentices are not eligible to a discount.